Grind CafeGrind is a modern coffee lounge with a cosy tranquil atmosphere serving speciality coffees and teas by fully trained barista's. There is a delicious range of homemade cakes, scones and muffins plus fresh hot panini's and homemade soup. One of the specialities of the house are the milk shakes and smoothies with over 100 different flavours to choose from, ranging chocolate digestive to jelly bean and even Weetabix! Grind is a modern coffee lounge with a cosy tranquil atmosphere serving speciality coffees and teas by fully trained barista's. There is a delicious range of homemade cakes, scones and muffins plus fresh hot panini's and homemade soup. One of the specialities of the house are the milk shakes and smoothies with over 100 different flavours to choose from, ranging chocolate digestive to jelly bean and even Weetabix! The friendly staff encourage customers to relax and wind down whilst enjoying a leisurely drink and snack and the outdoor seating area provides an ideal viewpoint to see the amazing fountain and water feature installed on the Bullring in 2009. Open 8am to 6pm Monday to Saturday and 9am to 5pm on Sunday. from 1st November (run up to Christmas) open 8am to 8pm Monday to Saturday and 9am to 5pm on Sunday. Closed Christmas day, Boxing day, New Year's day, May BH Monday, Easter Sunday and Easter Monday. 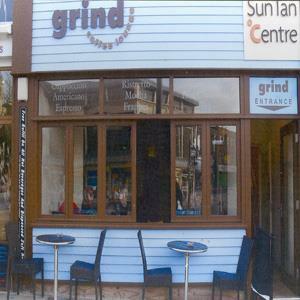 Grind is situated on the Bull Ring right in the city centre.